Fine Fiber Notes from Nicki: How Long? I weave with words & weft. Often a beetle comes along for the ride. Ah my continuing issue whenever I create a scarf...how long should it be? 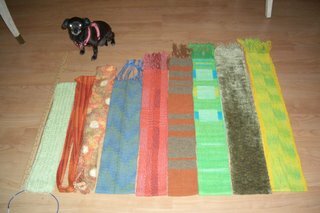 I haven't seen any golden proportion rule for scarves in my research so it is best to look at what I have done in the past and what I like to wear... my more favorite woven scarves are shown below including my mobius ones...my little green knitted scarf is on the left - chihuahua and yardstick provided for scale. That's my little green knitted scarf with two complete balls of yarn - it's fifty inches long...looks like I'll need a half a skein more. Although it feels nice...it looks pretty boring...perhaps I should unravel a couple of stitches on each side to add fringe for visual interest. I will ponder that as I knit more...I have tried to put in 12 stones per day. [What's a stone? I have 12 polished pebbles in a black navajo pot. I take them out when I knit and put them back one by one as I complete one full pass of knitting]. The stones help me concentrate and ensure I get something done. Although simple, this pattern is still a nightmare for me.